How Do You Preserve History On The Moon? As the 50th anniversary of the Apollo 11 lunar landing nears, some say the site of the first footprints on the moon should be protected. But historic preservation off our planet is unprecedented. Astronaut Buzz Aldrin walks on the moon during the Apollo 11 mission in 1969. The landing site at Tranquility Base has remained mostly untouched — though that could change as more nations and even commercial companies start to explore the moon. Some of his boot marks are still up there, after all, along with other precious artifacts from humanity's first steps on another world. Armstrong and Buzz Aldrin left behind tools and science equipment, a plaque that read, "We came in peace for all mankind" and the U.S. flag, which has likely been bleached white by five decades of harsh ultraviolet light. "There has never been historic preservation off our planet. It's a really difficult subject," says Michelle Hanlon, a law professor and space law expert at the University of Mississippi who co-founded For All Moonkind, a nonprofit group devoted to protecting historic sites in space. Last week, she brought the issue to the United Nations, in what she thinks is the first time the subject has been raised there. Speaking to a subcommittee of the U.N.'s Committee on the Peaceful Uses of Outer Space, Hanlon told the group that the Apollo 11 landing site is a cultural treasure similar to UNESCO World Heritage sites such as Egypt's pyramids or China's Great Wall. Any nation can nominate a place within its sovereign territory to be included on the World Heritage Sites list, she explains. The trouble with the moon is that, according to the 1967 Outer Space Treaty, no nation can claim sovereignty over anything in outer space. This legal gray area is why Hanlon wants the U.N. space panel to issue some kind of declaration stating that the Apollo 11 landing site has unparalleled cultural importance that deserves special recognition. The question is whether countries will be willing to agree on that kind of small step for preservation, or whether they'll balk at setting any precedent for putting part of the moon off-limits. Her group also wants the panel to similarly recognize the Soviet Luna 2 spacecraft, the first human-made object ever to reach another celestial body. It is still sitting on the lunar surface after touching down 60 years ago this September. Hanlon says a delegate from China approached her immediately after her speech to learn more, and that her organization will do additional outreach at another subcommittee meeting in April. Her goal is to get some kind of declaration when the full space committee meets in June. "I have a very strong team of lawyers from a lot of different countries who are going to be there in April, and I think we can really make a very good effort on this," Hanlon says. "What we need to do is find one country that is willing to sponsor our mission, if you will." 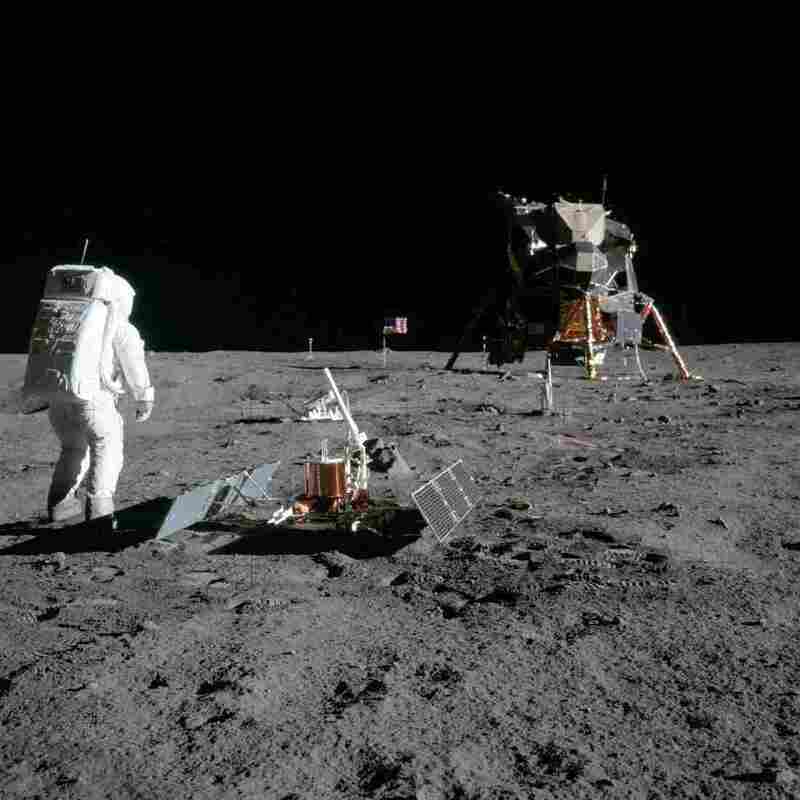 "I think they have just as good of a chance as anybody," says Lisa Westwood, an archaeologist with California State University, Chico, who has been interested in lunar history preservation for about a decade. "I think that their hearts are in the right place and they are working very, very hard to try to achieve some kind of international consensus. They're certainly talking to the right people." Efforts to preserve the historic sites on the moon go back at least to 1998. That's when Beth O'Leary was teaching a graduate seminar at New Mexico State University on the U.S. federal and state laws that protect archaeological and historical resources. A student, Ralph Gibson, asked her if federal preservation laws applied to the moon. "You know, you get a good question, you've got to run with it," O'Leary recalls. Gibson and another graduate student got a grant to study the issue. So far, early advocates for historic preservation on the moon have gotten the artifacts and objects at Tranquility Base into state history registries in New Mexico and California. "It's symbolic in nature," O'Leary says. "It recognizes space history and the archaeological record of space history." The Outer Space Treaty, she notes, establishes that nations retain ownership of any objects or structures that they put on the moon, so no one, for instance, could walk away with the U.S. flag. But that wouldn't protect the Apollo astronauts' footprints. "I don't think anybody would argue that this is not a significant, important, Earth-shattering event in the history of humanity," says O'Leary, "and all humanity participated." She was a high school exchange student living with a host family in Norway when the astronauts landed on July 20, 1969. She remembers watching the news broadcast on a black-and-white TV as the announcers spoke in Norwegian. Since no one has tried to protect any cultural artifacts on the moon before, it's unclear exactly how to preserve them. But some thinking has already gone into this, because a group formed by NASA made recommendations that "space faring entities" could voluntarily follow if they ventured to the moon. The recommendations set out areas around the fragile sites that should not be entered with rovers, for example, and warn against touching any hardware without prior permission from NASA. These recommendations were created in response to the Google Lunar X Prize, a competition that began in 2007 and offered a cash prize to the first privately funded effort that successfully landed a robotic spacecraft on the moon. It offered a huge bonus if the spacecraft could beam back images or video of one of the multiple Apollo project landing sites, which alarmed some experts because of the possibility of inadvertent destruction. "I was contacted by some of the companies that were competing for the Google Lunar X Prize," recalls Philip Metzger, a planetary scientist now at the University of Central Florida. At the time, Metzger was at NASA studying the blast effects from the Apollo lunar landings, and he and his colleagues found that the landings created surprisingly violent blasts of grit and dust. "[The companies] wanted to go visit the Apollo sites during those missions, and they didn't want to sandblast and ruin the Apollo sites." Metzger knew it was a real danger. In 1969, the Apollo 12 astronauts landed 160 meters away from the Surveyor III spacecraft that had been on the moon for a couple of years. The astronauts walked over and removed some pieces of the craft to bring them home for analysis to see how the lunar environment affected equipment. "Well, the main thing we discovered was that it was sandblasted like crazy from the landing of the Apollo lunar module," Metzger says. This image taken in 1969 shows two lunar landers: the Apollo 12 Lunar Module off in the distance and the unmanned Surveyor III spacecraft, which landed on the moon in 1967. Surveyor III was so damaged by rocks and debris from the landing of Apollo 12 that it turned from white to brown. That was a shock, since NASA thought it had landed far enough away for the robotic spacecraft to be safe. 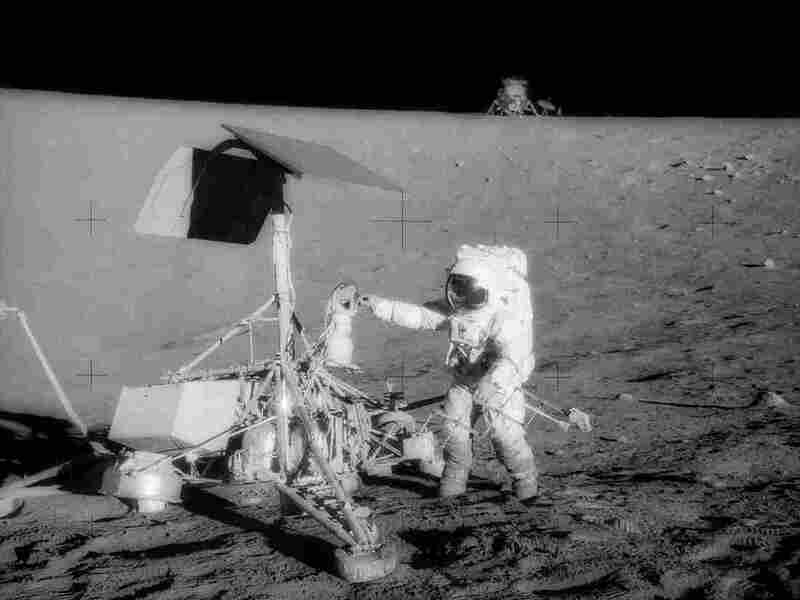 But Surveyor III suffered so much damage that it changed color, going from white to brown, as tiny bits of lunar soil got blasted onto its surface. And Surveyor III was even spared the worst of the damage because it was in a crater and protected from the main spray of debris. Since then, Metzger says, they've analyzed videos showing that the Apollo landings could eject gravel and even fist-sized rocks at high velocity. "If you landed within 100 meters of something sensitive, you could definitely have a bad day by hitting it with a rock at 50 miles an hour," he says. In fact, computer modeling shows that it's impossible to have a major landing on the moon without causing some degree of damage from all the dust and rock that gets stirred up — and that made it difficult for the NASA group to come up with recommendations about how future missions should go forward without unduly damaging the Apollo treasures. "Every time you land on the moon within 100 kilometers, you're going to cause a little bit of damage," says Metzger, "and so we were faced with this impossible question: How far away is OK to land your rocket on the moon?" The group eventually settled on a recommendation to keep landings about 2 kilometers away from the Apollo sites. "The boundary has nothing to do with real science," Metzger notes. "It's just a number we made up because we couldn't do any better at the time." He says it's important to retain access to the Apollo sites, for science and cultural reasons, while protecting them from excessive damage. "We would love to have people visit those sites and send back imagery. Not only for the scientific value, but for the cultural value, so that people can see again that we have visited the moon and it will inspire people to want to go back," Metzger says. Archaeologists and historians have been busy compiling lists of every human artifact on the moon, and there are a lot of them. The Apollo astronauts reduced the weight of their ascent vehicle by throwing everything out the door that they didn't need before returning home: hammers, towels, cameras. "They created, just before they lifted off, a toss zone, a scatter of artifacts," says Westwood, who says more than 100 objects have been inventoried at Tranquility Base. Metzger personally thinks that one of the most scientifically interesting items from the Apollo landing sites are the bags of human excrement. "I think the most important thing on the moon would be the bags of human poop because they are incredibly valuable for science," he says. "These are samples of human biological material including microbial life that we placed on the moon decades ago. We would love to find out, did anything survive?" Some research of that kind might be OK with preservationists such as Hanlon. "It's like archaeology on Earth. This isn't about putting something away and locking it up and throwing away the key," Hanlon says. "It's making sure that the right people get to these sites first so that we can eke out all the science that we can and then also preserve what should be preserved for posterity." 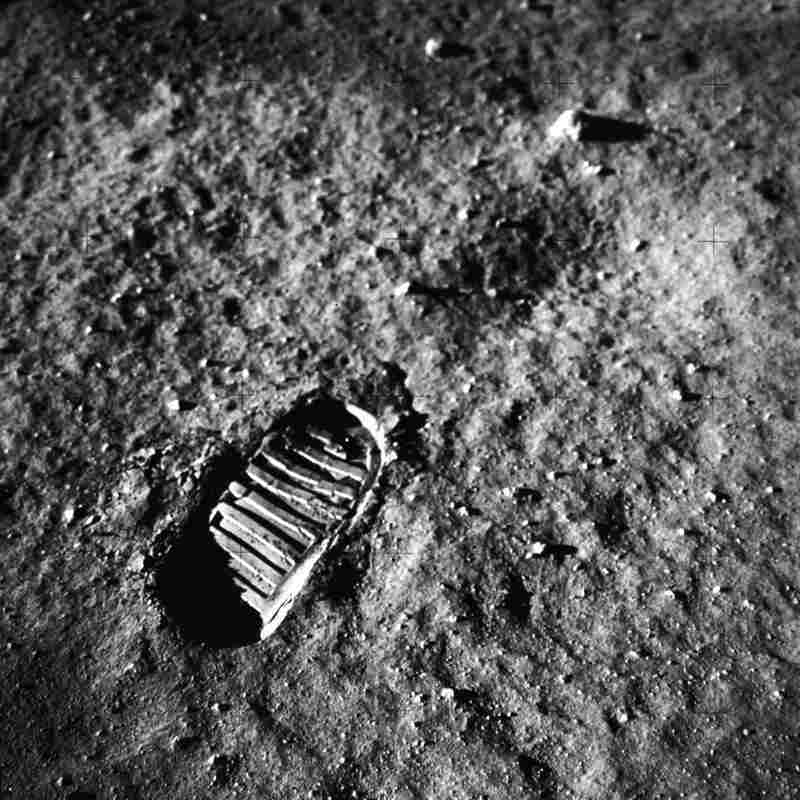 Hanlon says whatever is left of the Apollo 11 astronauts' boot prints, however, needs to be protected. While the blast of the ascent vehicle's takeoff might have erased Armstrong's very first imprints in the lunar soil, satellite images show that some tracks farther away from the spacecraft have remained. Hanlon would eventually even like to see some kind of structure built over them, to create a kind of lunar history museum.